The following diagram explains the main code workflow for a search app. 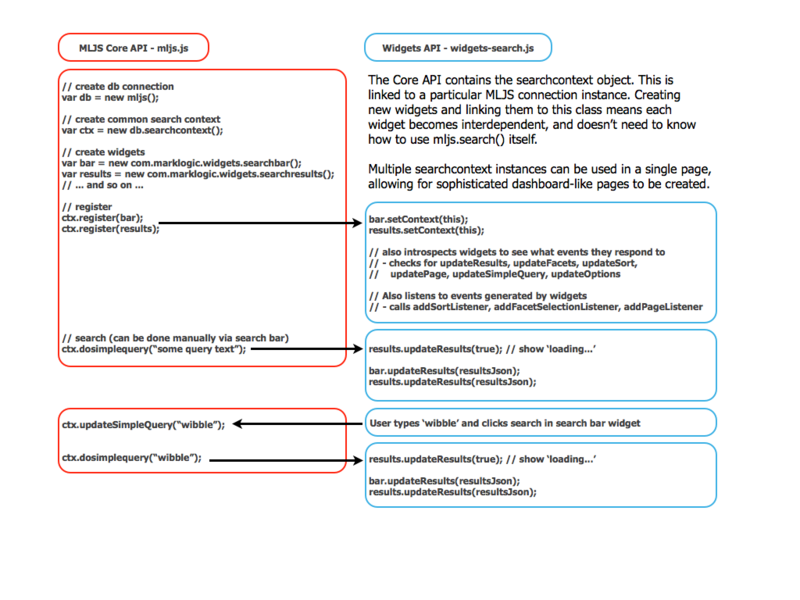 As you can see a search context object instance is used to bind widgets together. No widget knows of the existence of another one - the developer merely calls the register method on search context to bind a new widget to the search context. The register() function is a convenience such that the application developer doesn't need to know what events and actions are supported by each widget instance in order to use them. It is required that all widgets adhere to the same naming convention for event listeners and actions. This convention is how the searchcontext object can introspect each widget to determine how it can be used. In the above example both the search bar and results widgets have a setContext() method and an updateResults() event listener method. These are discovered by the searchcontext.register() function and called as appropriate. This function introspects the given object to see if it can receive events or allows certain listeners to be added to it. The Search Context then registers itself to the appropriate add*Listener methods, and adds functional wrappers to register the given class as a receiver of the Search Context's own events. The search context also tells the object about itself, allowing direct function calls on the search context instance. Thus when a user clicks a column of a High Chart, the chart calls contributeFacet on the search context. This causes a new query to be sent to MarkLogic. The results of that query are then sent to all registered widgets, including the highcharts object itself. The register function is a convenience method so that application developers don't need to understand the intricacies of event passing for search between objects and the search context. There is nothing stopping application developers registering their own callback functions on the search context for event handling directly, though. The search context's main job is to take inputs from a variety of sources, create a query, submit it to MarkLogic, and distribute the result. There are two REST API endpoints that accept these text or structured queries. One is /v1/search for free text and structured query, giving a results list (page). The other is /v1/values which returns lexicon values, and allows for co-occurence results to be retreived (via tuples configured in search options). By default you will want to use /v1/search to query across documents in MarkLogic. This is the default in the search context also. When using the co-occurence widget or lexicon lookups though you need to run against the values endpoint. Calling valuesEndpoint() on a search context instance makes this happen. The search context will then raise updateValues() callbacks on registered widgets. In many human driven scenarios a 'google like' text box is used allowing a query to be entered. This is free text with a few extra options, such as using AND and OR for boolean logic, () parantheses to surround complex query patterns, - for a negation operator, and animal:cat for restricting terms to named constraints. This is supported in the search context by using doSimpleQuery(). MarkLogic parses the text using it's grammar and executes the query. In some circumstances, however, a computer programme may be generating the query. This is typical on dashboard pages or where multiple widgets affect different parts of a query. E.g. a map with a selectable area controls a geospatial constraint. This is not easily done in a free text grammar. For these situations, the search context provides doStructuredQuery() and contributeStructuredQuery() methods. The first method replaces the entire query and executes this against MarkLogic. The second method allows several components to affect different parts of the query. The search context updates just the part of the query contributed by this widget, and then produces an and-query of this plus the other unchanged query terms, and executes this against MarkLogic. MarkLogic search supports results in either a JSON or XML wrapper. The search context is independent of these, but defaults to json. Call the setFormat("json|xml") method on the search context to select this. If using JSON as a wrapper, but the document results are XML (RAW mode assumed), then this will be exposed as a JSON text string in the search results. Use the db.textToXml() method to convert this to an XMLDocument instance. This is useful for if you want to execute XPath over the content within the browser.